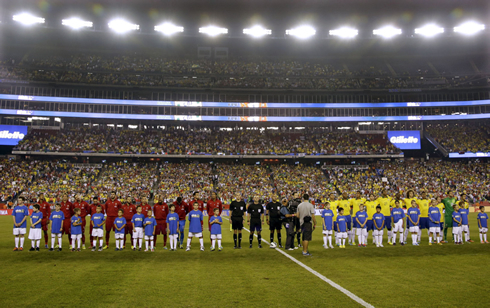 Brazil and Portugal clashed in Boston this Tuesday night for an international friendly, but it were the Brazilians who came off with a smile after a 3-1 win. With Cristiano Ronaldo injured and unavailable for this game, the Portuguese team has fallen short against the 2014 FIFA World Cup hosts and ended up seeing Neymar drawing the spotlight onto himself. Just four days after having relied on Cristiano Ronaldo to beat Northern Ireland in an exciting 4-2 win, the Portuguese National Team had to face Brazil at the Gillette Stadium in the United States, without being able to count with their main player. Ronaldo picked up a small injury last week that forced him to miss this Tuesday's night friendly and Portugal ended up being easily outgunned against Felipe Scolari's men, as the "Lusitanos" got defeated by 3-1. Raúl Meireles still gave hope to his home nation supporters early in the first half, but Brazil's attacking avalanche started shortly after, with Thiago Silva, Neymar and Jô scoring the goals that allowed the "Canarinha" to turn this game into their favor. Paulo Bento made two changes in the team after that 2-4 win at the "Windsor Park" against Northern Ireland. Manchester United winger Nani took over for Cristiano Ronaldo and Nélson Oliveira replaced Valencia's Hélder Postiga as the team's centre forward. As for Brazil, Scolari picked the same starting eleven that he had already chosen for last Saturday's friendly against Australia and it has proven to be the right choice once again. Six minutes after Raúl Meireles opening goal, the game got back to square one due to a header from PSG's centre defender Thiago Silva. Neymar took a perfect corner-kick on the left and the defender who has been hinted many times with a possible move to Barcelona, rose to the second floor and beat Rui Patrício with a very powerful header. Paulo Bento made the Portuguese defense to play zone when dealing with corner-kicks and the result was that Miguel Veloso ended up being the man closer to the action, who proved to be unable to match his opponent's physical presence. 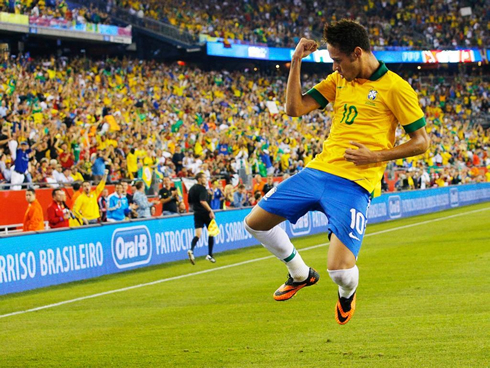 The Brazilian National Team didn't slow down the pace after the equaliser and with 34 minutes on the clock, Neymar showcased all his talent in a brilliant solo run that ended up with the new Barcelona star striking the ball into the back of the net. The 21-year old picked a ball that had been lost by Nani still in the midfield, went ahead with his mind set to take on whoever got in front of him, dribbled AS Monaco's João Moutinho, Miguel Veloso and Real Madrid's Pepe, just before finishing it off with a clean right-foot shot. Nothing but sheer brilliance from the former Santos forward and one can only wonder about when we will be able to see these kind of displays in the Spanish League. The 2-1 score resisted until half-time, but Brazil would came on to the second half determined to settle things as soon as possible. With only 4 minutes played after the break, Neymar started a Brazil attack on the left once again and made room for Maxwell to collect a pass on the back of the Portuguese right-back João Pereira. The 32-year old PSG defender sent in a strong low cross right between the goalkeeper and the defenders' area of action, a pass that Jô was quick to read. The Atletico Mineiro's forward had nothing between himself and the goal line, so he easily pushed the ball into the back of the net, to make it 3-1 to Brazil. The result wouldn't suffer any further changes and the two teams left the pitch knowing that the next time they will meet, things can be a lot different if Cristiano Ronaldo is available to play. The Portuguese player's absence was made felt throughout the entire game, but this being a simply friendly and with the whole season ahead, it wouldn't have made any sense to force any injury aggravation just so that the fans could be delighted to see the first Neymar vs Ronaldo duel on the pitch. In fact, we'll have an opportunity to see not only Ronaldo and Neymar on the pitch next month but also Gareth Bale and Lionel Messi, by the time the first "Clasico" of the season Barcelona vs Real Madrid takes place in the Camp Nou, on October 27. Cristiano Ronaldo next game for Real Madrid will be for the Spanish League "La Liga" against Villarreal, this next Saturday (September 14, 2013) at the "El Madrigal". You can watch Juventus live stream, Villarreal vs Real Madrid, Barcelona vs Sevilla, Manchester United vs Crystal Palace and Sunderland vs Arsenal, all matches provided from our live streaming section.